Beautiful certificate from xraymedia.com, Inc. issued in 2001. This historic document has an ornate border around it. This item has the printed signatures of the Company’s President, Raymond C. Dabney and Treasurer, and is over 10 years old. XRAYMEDIA, Inc. develops a general media Internet portal. The company, through its Web site, Xraymedia.com, intends to offer three media specific business portals, including buy and sell services, public relations services, and advertising agency services. Xraymedia was incorporated in 1968 as Port Industries, Inc. It changed its name to Digital Reporting, Inc. in 1994, to Cyberguides International, Inc. in 1997, to AJA Merchant Banking Corporation in February 1998, to Image Photo Systems, Inc. in December 1998, and to e-bidd.com, Inc. in 1999. The company further changed its name to XRAYMEDIA com, Inc. in 2000 and to XRAYMEDIA, Inc. in 2003. Xraymedia is based in Vancouver, Canada. ¶ 1 XRAYMEDIA, Inc. (XRAYMEDIA) and Raymond Dabney (Dabney) have settled the following issues with the Executive Director. 1. XRAYMEDIA was incorporated in Minnesota, Minneapolis, USA on November 27, 1968. Its securities trade on the National Association of Securities Dealers Over the Counter Bulletin Board. It has never been registered, and is not a reporting issuer, under the Act. 2. XRAYMEDIA’s executive offices, operations offices and computer servers are located at 555 West Hastings Street, Suite 1560, Vancouver, British Columbia. XRAYMEDIA’s ten employees work at the Vancouver office. 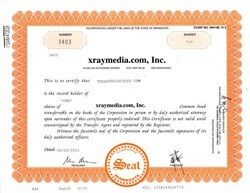 XRAYMEDIA is not registered in British Columbia as an extra-provincial company under the Company Act, R.S.B.C. 1996, c. 62. 3. XRAYMEDIA purports to be a traditional full-service advertising agency and, also, claims that it hosts an internet-based marketplace for buying and selling advertising which XRAYMEDIA lists and refers to as “media inventory”. 4. Dabney has been a director of XRAYMEDIA since 1999, and is its majority shareholder, president and chief executive officer. He is a resident of British Columbia and works at XRAYMEDIA’s office in Vancouver where he directs operations. He has never been registered under the Act or any other securities legislation. 5. Between March 2003 and September 2003, and on behalf of XRAYMEDIA, Dabney issued twenty-two press releases (the Press Releases). The Press Releases contained misrepresentations in that they stated or implied that large amounts of media inventory were being sold through XRAYMEDIA’s internet-based marketplace and that XRAYMEDIA was, as a result, generating significant revenues and profits. None of this was true. (h) based on generally accepted accounting principles, XRAYMEDIA had no revenues or profit. 7. On July 23, 2003 on behalf of XRAYMEDIA, Dabney issued a press release which included an undertaking that its shares would yield a profit of $0.02 per share (the July 23, 2003 Press Release). Public Interest 8. In issuing the Press Releases, Dabney and XRAYMEDIA made misrepresentations contrary to section 50(1)(d) of the Act. 9. In issuing the July 23, 2003 Press Release, Dabney and XRAYMEDIA made a prohibited representation, contrary to section 50(1)(b) of the Act. Mitigating Factors 10. The Executive Director has taken into account the fact that Dabney and XRAYMEDIA actively cooperated with staff of the Commission in the course of this investigation as mitigating the sanctions which would otherwise have applied in the public interest. (b) not to say anything, in writing or orally, which may contradict the terms of this settlement or call those terms into question. (d) under section 161(1)(d) of the Act, Dabney be prohibited from engaging in investor relations activities for the later of five years and the date by which Dabney has paid $30,000 to the Commission. Waiver ¶ 3 XRAYMEDIA and Dabney waives any right they may have, under the Act or otherwise, to a hearing, hearing and review, judicial review or appeal related to, in connection with, or incidental to this settlement.